Nowhere is that axiom truer than the various disciplines of science - and even history. 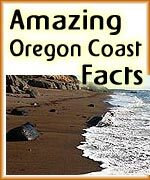 And on the Oregon coast, history and science can be outrageously odd. Facts are truly freaky at times. Who needs Halloween and ghost stories when the actual story is so weird, even scary in moments? This is a place where much of this inescapably beautiful landscape was given birth to by lava flows so enormous they’re beyond imagination: searing masses of molten earth as high as 20 feet and as long as hundreds of miles. It’s where skeletons found in rivers tell a spooky tale of possible buried treasure. 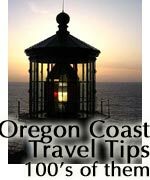 Oregon’s most hidden ghost town is cloistered along this shore, a paradise-like, bustling resort that is now buried beneath more than sands of time. Then there are the goofy bits of history that have become like lore or legend – like the celebrity wearing a pink leisure suit on a hotel marquee or the famed exploding whale of the central coast. 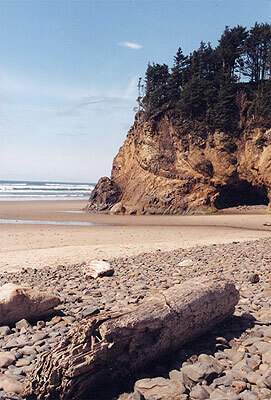 Oregon’s coast is, of course, primarily a place to go to have fun, kick back and relax. But sometimes just being armed with the knowledge of the strange story behind some of the things you see will allow you to enjoy these shores on a whole new level. In some cases, you’ll be able to find more interesting things to check out. 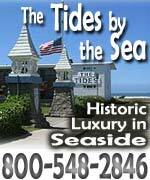 Singer Pat Boone used to have an interest in a hotel in Waldport, and it had some comical side effects. The relationship to the hotel is unclear, but in the early 70's it was called the Pat Boone Inn, located in the Bayshore district. He apparently was part owner or had some interest in the place. 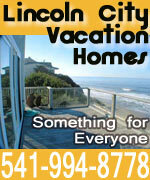 Several central coast locals remember being at the opening gala of the hotel, with Boone being present. Somewhat notoriously, however, the marquee not only featured a picture of Boone and his smiling face beaming down on Highway 101, but he was wearing – get this - a pink leisure suit. In a later life of the hotel, in the late 70’s, the Heaven's Gate cult held a gathering there (the UFO cult that became infamous in the 90's for committing mass suicide in California). 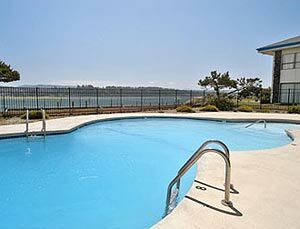 It later become the Bayshore Inn several times over the decades, and most recently it’s known as the Howard Johnson’s and now it is the Waldport Beach Hotel. About 15 million years ago, huge walls of lava came scorching across the landscape from what would later become western Idaho, disintegrating everything in its path at a few miles per hour. These lava flows lumbered their into the sea, having come from an enormous soft spot in the Earth’s crust that poured out numerous such eruptions over millions of years. Sometimes, these hideous heat monsters didn’t stop at the sea: they kept going underground, burrowing into mud and softer sediment – especially beneath the ocean – then actually coming up somewhere else in a re-eruption. Those re-eruptions of what is called the Columbia River Basalt lavas formed a lot of things we see and recognize instantly on the coast, like the gigantic Haystack Rock at Cannon Beach, Twin Rocks at Rockaway Beach and many more of these basalt islands in the sea known as sea stacks. 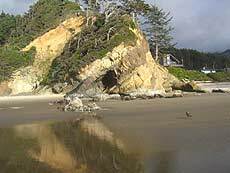 At the rather wild beach spot of Hug Point, just south of Cannon Beach, geology, beauty (and even human history) come together in some weird ways. 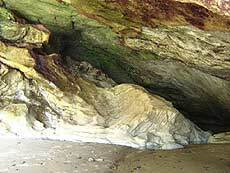 The place is full of strange wonders both immediately identifiable and beneath the surface. One is a curious zigzag pattern in the sandstone bluff that jumps out at you right away, especially as you walk down the sloped path to the beach. Often, that’s all you’ll see of this beach, as the tide doesn’t allow you to see much else here about 20 percent of the time. This weird pattern, according to Seaside geologist Tom Horning, is the result of one of the processes behind the re-eruptions of that fiery time. Horning goes on to explain that these sandstones were buried several hundred feet beneath an overlying layer of deeper water mudstones at the time of the lava invasions. This allows geologists to trace some really prehistoric landmarks. 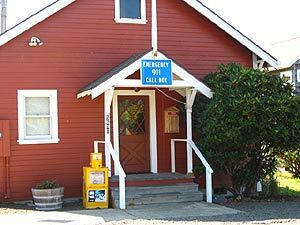 According to the North Lincoln County Historical Museum in Lincoln City, some strange and possibly sinister bits of history are lurking in the area. 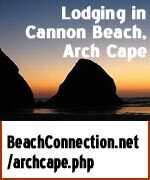 A skeleton of an eight-foot African-American man and two other men were found near Three Rox Bay in Lincoln County (near Cascade Head). These bones were believed to be the remains of men who were shipwrecked in the 1700s, and left behind to guard some kind of treasure. What’s odd here, say museum managers, is that while the treasure portion of the tale is a longtime local legend, the bones were found in 1932 – long after the treasure legend is known to have been circulating around the county. It’s November 1970. 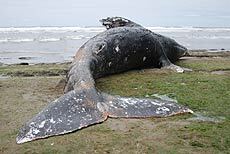 A massive whale carcass washes ashore on a Florence beach, bringing quite a media frenzy, hordes of onlookers and a nasty stench, despite the cold winter air. At this time, Oregon Highway Division is in charge of the proceedings. It’s still called that. The name of Oregon Department of Transportation – or ODOT – hasn’t been mandated yet. But a state agency is a state agency by any other name, and the division makes a historic blunder of, well, whale-sized proportions. To take care of the creature, they decided to stick dynamite next to it and blow it to bits. It was, to say the least, a learning experience. The idea was that if they exploded a device from one side of the whale, in just the right angle and spot, it would blow the whale apart into a myriad of smaller pieces. Those would theoretically be more manageable and could be buried in the sand, while smaller bits would be gobbled up by birds and such. In one extremely famous film clip, still available on the Net, a very young Paul Linneman from Portland's KATU-2 comments as the whale is blown up. He is suddenly forced to run as it rains various sized chunks of blubber onto a cheering - then panicking - crowd. One flying slab wrecked a car a quarter of a mile away. Meanwhile, you could hear chunks making squishing noises in the background as they hit the ground. A man named Thornton, who was the Highway Division's head of the project at the time, will still not speak to the press to this day. Back in 2000, the Eugene Register-Guard did a thirty-year retrospective on the infamous event and he still refused comment. 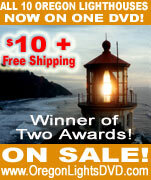 Footage of this is still one of the hottest Internet downloads around. Simply do a search on "exploding whale" and you'll find film footage of it and various articles, including one by humorist Dave Berry. 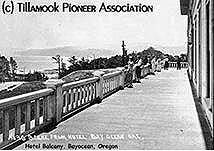 What you now see as the Tillamook Spit - miles of what seems like unending dunes and hiking possibilities - was for a brief period a thriving resort town that hosted thousands of people in the summertime. But after only 15 years of existence, the place gradually fell into greater and greater disrepair, eventually becoming a ghost town. Now, about 100 years later, nothing tangible remains of this place. It is the ghost of a ghost town, completely reclaimed by nature. It all began around 1906, when a Kansas developer named Potter bought the land with his son. 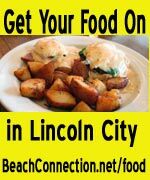 They set about building this grandiose resort, which included two hotels, a drug store, grocery store, a “bungalow city” and a “tent city,” as well as tennis courts, a natatorium that housed a movie theater, a tin shop, bowling alley, a cannery and other attractions. A diesel engine provided electricity and the area had a decent phone system. 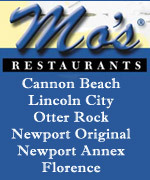 Miles of roads were even built, and the place had its grand opening in 1912. There were around 600 plots set for homes, many of which were built, and Bayocean was well on its way to become the "Atlantic City of the West." That was the plan, and that was the ad campaign, but it never quite materialized. The honeymoon was relatively short. Its heyday lasted only a few years. The first man to buy a lot from Potter’s company and began a feud that was the beginning of the end. Francis Mitchell started its first businesses and the post office, but he also soon began accusing Potter of fraud. This feud lasted for years and split the town’s growing residency. Eventually, Potter’s company failed, and the resort changed hands a few times, closing and reopening periodically throughout the 20’s and 30’s. 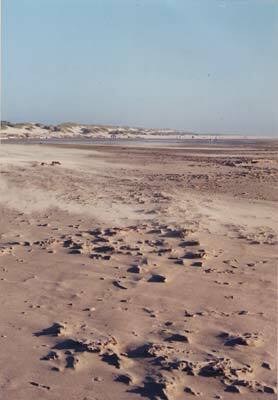 By the late 20’s and 30’s, erosion began reclaiming the spit, and some buildings started to fall into the sea. Each winter brought some new disaster. 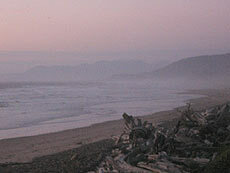 The construction of the jetties at the mouth of the bay is considered to be the culprit, as these change the action of the waters and how they affect the shoreline (much in the same way the construction of the jetties at the mouth of the Columbia changed the shorelines of Warrenton and Seaside). It went through several phases of being occupied by a few here and there who tried to restart some of the businesses and even an artist colony or two. About 1970, there is one report from a former local who grew up there when the Potter family kickstarted their venture, telling about what he saw in the 60’s. At the time, he was in his 80’s, and rather forlornly, even bitterly, describes seeing a “hippie” town occupying the area. The natatorium started crumbling in 1936, completely disappearing by 1939. The Post Office shut down in 1953 after the majority of the residents moved away, with, ironically, Mitchell being the last to leave. A year later, the spit was breached by a massive storm. That eventually “healed” itself, but Bayocean was firmly a ghost town and doomed. The rest of it was bulldozed over in the 70's by the government. Bayocean's meeting hall - now in Cape Meares - is all that's obviously left of the old community. Supposedly, at extremely low tides, you can see the remnants of a boiler in the water just off the town of Cape Meares. Some residents of that tiny village will tell you the diagonal shoreline of the village was Third St. at the height of Bayocean's brief romp. There was a 1st St. and Second St. back then. That's how much storms and tidal conditions had destroyed the place in the middle part of the century. 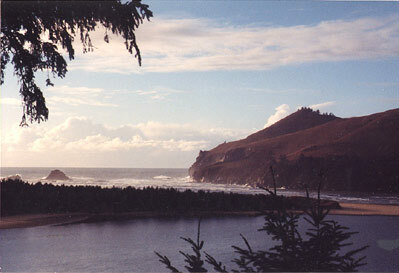 A few buildings were saved and moved to Cape Meares. The community gathering place there is the former school and church from the old resort. There is some talk you may occasionally find part of a structure in the form of a chunk of concrete or metal somewhere in the dunes. That’s all that is left of a true ghost town.